In the wake of last weekend’s shootings in Tucson, Ariz., the issue of gun control and gun rights has returned to national prominence. The Pew Research Center has tracked attitudes about this issue since 1993. In September, public opinion was divided: 50% said it was more important to control gun ownership while 46% said it was more important to protect the rights of Americans to own guns. Opinion about gun control has been split since April 2009, but this marked a substantial change in attitudes from previous years. 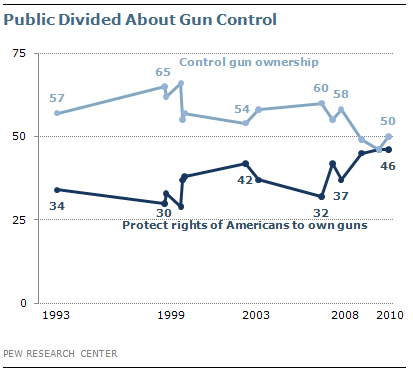 From 1993 through 2008, majorities of Americans consistently prioritized gun control over gun rights, with a particular uptick in support for gun control following the Columbine High School shooting in 1999 (a few months after that incident 62% said controlling gun ownership was more important than protecting gun rights). More recently, just a few days after the 2007 shooting at Virginia Tech, 60% said gun control was more important.